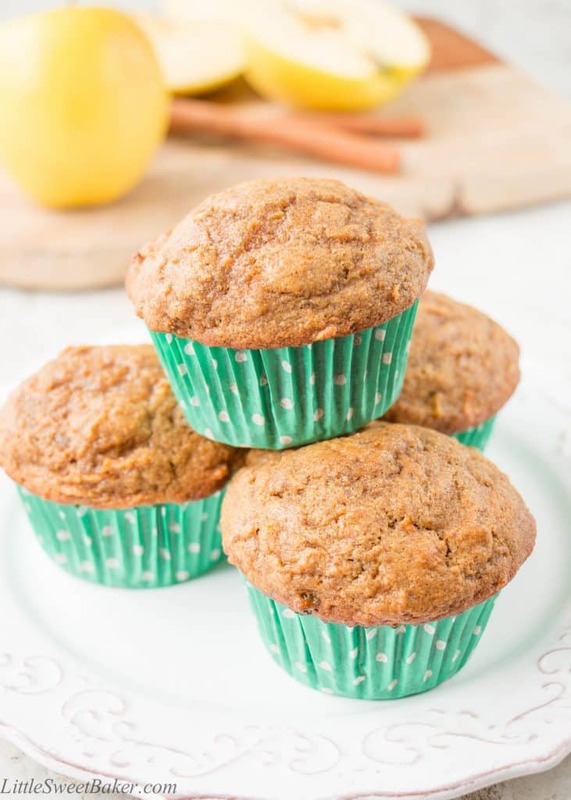 These delightfully soft and moist muffins are made with whole wheat flour, coconut oil, and sweetened with maple syrup. They are packed with wholesome goodness and full of flavor. I can’t believe how quickly the summer is going by. There is only one more week until the kids are back in school and everyone is back into a routine. So, as a mom it’s time to start thinking about school lunches, healthy snacks and quick breakfast ideas (and earlier bedtimes). These muffins are loaded with fruits and veggies, and are made with only healthy ingredients. There is no refined sugar in these delicious goodies. 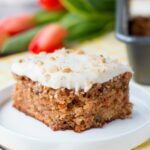 They are naturally sweetened with maple syrup, fresh apples, carrots and raisins. 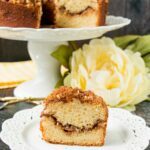 The texture is unbelievably moist and fluffy considering they are made with whole wheat flour, and there is no butter. 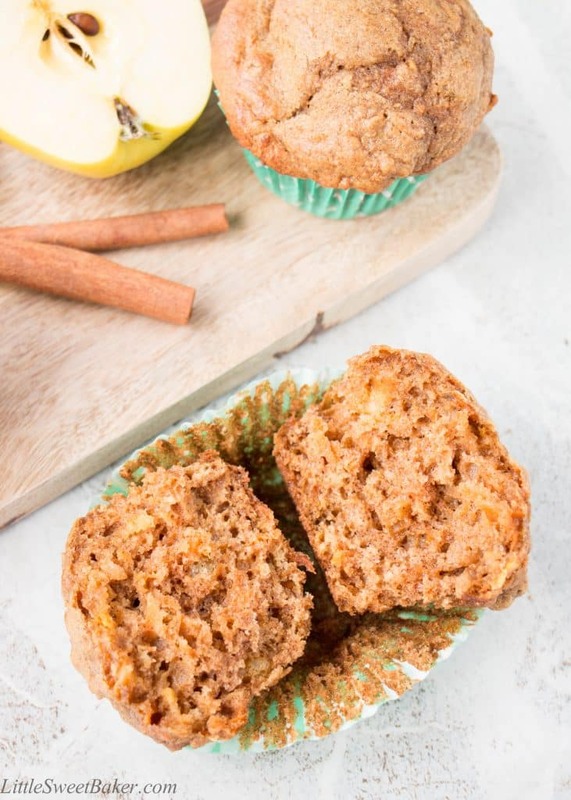 They taste like a cross between an apple spice muffin and a carrot cake, all wrapped in a portable little package, which makes them perfect for lunch boxes, an after-school snack, and/or a quick grab-and-go breakfast. 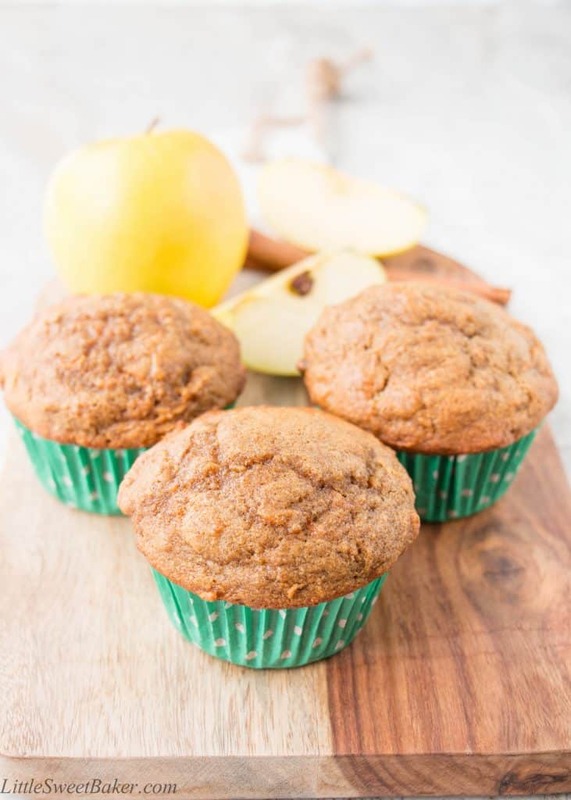 These apple carrot muffins are mom-approved and kid-approved because they are wickedly delicious and absolutely healthy. In a large bowl, toss together the flour, baking soda and cinnamon. Set aside. In a medium bowl, whisk together the coconut oil, maple syrup, eggs, yogurt and vanilla. Pour the wet ingredients into the dry and stir until the batter starts to come together. Fold in the carrots, apple and raisin until just combined. Spoon the batter into the muffin cups. Bake at 425F for 5 minutes, then reduce the temp to 350F and bake for another 15 minutes for until a toothpick inserted into the center comes out clean. Muffins can be stored in an airtight container at room temperature for up to 3 days or in the fridge for up to 5 days. They can also be stored in the freezer for up to 2 months. I’ll be sharing this at Fiesta Friday #134. These muffins are perfect for any occasion and I love the fact that they are healthy. I made them a while ago and they are delicious! I am planning on making them more often when my kids go back to school to pack them for lunch. Thank you for sharing! You’re very welcome Olivia! 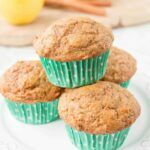 My kids love these muffins in their school lunches too and I feel great as a mom making these for them. 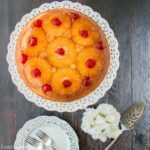 Is normal whole wheat flour okay to use, or does it have to be pastry flour? The texture won’t be as soft and fluffy as using pastry ww flour, but if that’s all you have, it will work. I hope you enjoy the muffins! You’ve guessed right and thank you for catching my typo. I hope you enjoy the muffins and have a great weekend!